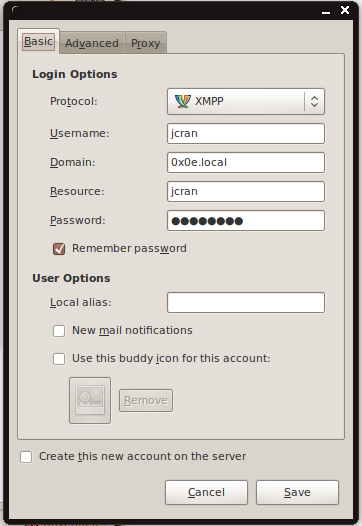 It turns out to be super handy to be able to monitor your logs (and send commands) via XMPP. To do so, here is a simple setup. Just got done setting up an internal jabber server on my domain. Why you might ask? You’re not that popular that you need your own chat server are you? Definitely not. But there’s a lot of crap going on in a network, even a small one, for you to benefit from on-demand notifications. An internal jabber server is a great way to implement this. Okay, well, now i need a jabber server. So, naturally, if you’re like me, you take the first google link and run w/ it. Fail, and fail hard. Jabberd, the original Jabber implementation, is a pain to set up. Okay, let’s scrap that and try again. Ejabberd. “Oh neat, Erlang!” you might say. — Wrong again. I wasn’t able to get this set up an configured in any sort of easy way. Possibly due to leftover cruft from jabberd. Here’s the link just for the record. …more searching, and came across this server called Prosody. Hmm, this looks really trivial, and it’s in apt already. Exactly what I’m looking for. Now, just configure w/ a host (toss these lines to the top of the config file /etc/prosody/prosody.cfg.lua) - or see the full config. _jabber._tcp.0x0e.local. IN SRV   0 0 5269   jabber. _xmpp-server._tcp.0x0e.local. IN SRV   0 0 5269   jabber. _xmpp-client._tcp.0x0e.local. IN SRV   0 0 5222   jabber. More info on account control here. Other, more specialized config info can be found here. You should see the script initialize in your im client if everything's configured properly. One thing you may run into is that syslog-ng may exit immediately, and keep attempting to run the jablog.rb file. If this happens, double-check your ruby config (make sure the syslog-ng user has access to the ruby environ (ie, not in your user's rvm environment). Once it's configured properly, restart syslog-ng and you should see the script initialize in your IM client. Note that I didn't specify how to configure SSL here, but you can definitely do that. See the docs. Special thanks to quine who pointed out you don't need to specify a connect server, the SRV records take care of that. Take the recipe / script, rinse and repeat on all your servers, and let me know if you make any improvements. Also, if you end up running the jabber server on one network, and need access to it from another, dnsmasq is super handy. See this blog.